I just finished four full weeks (28 days to be precise) in Spain. This is what I’ve learned, what I’ve loved and what I’ll want to see again. But what you’re probably most interested in: the cost, financial or otherwise. Things I’ll miss: delicious, delicious tapas (especially those from Granada); reliable and near-constant wifi (weefee!) access; practicing my Spanish, albeit terribly. Things I’m happy to be without, for the time being: small portions (tapas are great, but so many meals of them gets a bit tiring); Serrano ham is delicious, yes, but again, after so many cheap bocadillos I don’t want to have any more pork for a while; the Andalusian accent. It’s not as easy as elsewhere in Spain and I found it rather difficult to practice what little Spanish I know when it’s near-impossible to understand those you’re speaking with. On living the Spanish lifestyle: Seriously, I don’t know why we don’t have more plazas here in America. They are very obviously one of the best things in the world. You can sit at a nice café and enjoy your dinner people-watching. Or you can meet your friends there for a night out. Or your city can set up a giant stage and host free concerts (with fireworks!). What’s not to love? Also, I totally understand the value of a siesta. With the weather like they’ve got here along the Mediterranean, it’d be ridiculous not to take one. Best tapas: Granada and Madrid were probably the places I had the best-tasting tapas, but Granada wins out for sure because they were so much cheaper. FREE. Just the way it is in Granada… maybe because it’s a bit of a university town? Best night out: Though I had a lot of nights where I was out past 5am, the best was in Seville probably because of the company I was with. Sometimes you just get along with people, and sometimes you don’t. Place I’d like to go back to practice my Spanish: The accent was easiest to understand in Valencia and I found it to be the most comforting place to speak in Spanish. Not very turistic either, unlike Seville. Favorite museum: The Prado in Madrid is absolutely amazing, though I think this time around I honestly preferred the Reina Sofia. The Prado’s collection is the second largest in the world (behind the Louvre) and it’s equally incredible. The Reina Sofia, however, has a modern building and a pretty impressive collection of contemporary art. I particularly liked the new building (and the restaurant/bar with free wifi) not to mention Picasso’s Guernica. Favorite drink: The Spaniards like their red wine. And rightfully so! They mix it with Coca-Cola to make calimocho (not as bad as it sounds and it’s cheap); they mix it with fruits & spices to make some pretty amazing sangria; or they just drink it because it’s pretty damn good on its own. Personally, sangria won out for me. My best glass was a homemade pitcher in my Valencia hostel. Throw in a bunch of alcohol-soaked fruit, and you’ve got a great night. On hosteling: I stayed in three different hostels in Madrid—it was hard to find one that had availability at the last minute and I was only booking a day or two ahead. My favorite was La Posada de Huertas. It was closer to some of my favorite areas of Madrid (La Latina & Lavapies) and had a nice open lounge with wifi which made it easy to meet other travelers. 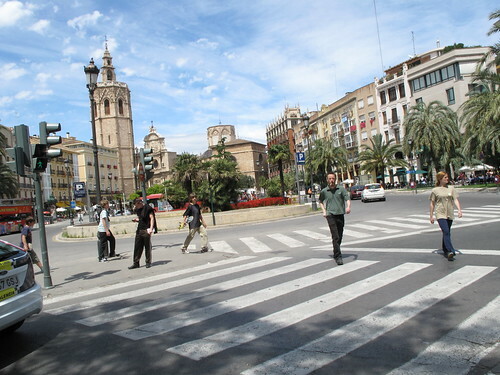 In Valencia, Home Backpackers was cheap and had a nice atmosphere. It was in a great location, too. Oasis Backpackers’ Hostel in Seville, very obviously a party hostel, was actually very nice. It was clean, had reliable Internet access, a swimming pool (!!) and gave you a free drink on your first night. Though Oasis also has a hostel in Granada, I chose to stay at Funky instead. The staff there were so friendly and helpful—the atmosphere was awesome. And again, you got a free sangria on your first night. In Cadiz, I was lucky to find a hostel at the very last minute: Casa Caracol. It was in a great area and had an awesome roof terrace with comfy hammocks. On my list for my next visit: San Sebastian, Toledo, Segovia, Cordoba and Barcelona just to begin with. I’d like to go back to Granada and Seville. And there are some more beaches along the Costa del Sol that I’m sure are worthy of a visit. And of course, though it’s not Spain, I’ll need to eventually make it to Portugal. 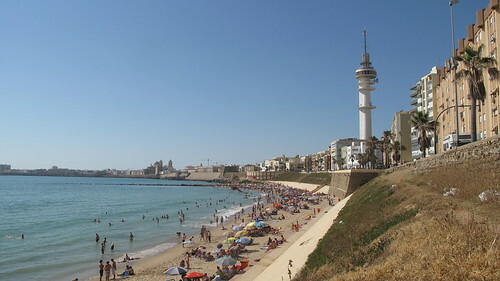 Best beach: Cadiz. Just look at the crowds (beautiful people), the sand (so soft) and the water (calm, but not too calm). Best Kebab. No question: Granada by a very high margin. Granada, to me, best represented the fusion of Moorish and Christian culture. The Albaicin (old Moorish district) was probably the most interesting I found in Andalusia. And that’s where the best kebabs in Spain can be found. Cheapest bocadillo: Bocadillos are sandwiches—just a baguette and whatever is inside of it. And usually, that’s a few slices of Serrano ham. In Madrid there’s a chain of delis—Museo de Jamon—which serve up the cheapest bocadillos. Just a single Euro for a tasty snack. Plus the cañas were also only 1 Euro. And you can’t go wrong with that when you’re on a budget. Best croquette: Unfortunately I had my best croquette on my very first night in Spain. I was a big jet-lagged and ended up being out pretty late, so I have no idea where in Madrid I had it. I just know it was absolutely delicious. And it was one of the few bars in Madrid where you didn’t have to buy the tapas. Total cost of four weeks in Spain: This is the number that everyone wants to know. Is Spain cheap? Is it as cheap as people believe it to be? It can’t be, can it? Well, I crunched the numbers and in 28 days, I spent a total $1,766.21 USD. That’s a little higher than my budget, but I still think Spain was pretty cheap. I’m sure it can be done cheaper, too. I ate just about every meal out, most of my snacks were fruits from various markets and I only cooked a handful of meals. Plus it was month one of my RTW trip, so I haven’t quite acclimated to a new lifestyle without a paycheck. I also splurged on a few nice meals and pretty much drank, on average, every day. If you examine the cost on a per-day basis, $63/day really isn’t that bad. It’s about what my monthly budget for living in Boston would be, and this month included 7 different cities across the Iberian peninsula. Who can complain about that? Hey Romana! Yes, I think I remember you mentioning that. I’d actually love to get to Portugal. I was so close to going last year b/c I had two friends from Seville headed that way, but I didn’t feel like diverging from my itinerary at the time. Also, I hear there are a ton of hipsters in Lisbon! love Spain. Its really good site to live. I spent a month in Sevilla and absolutely like it. Thanks so much for your comment! You’re completely right that Northern Spain is much more likely to cost more—especially if you make a stop in Barcelona. I’ve heard such amazing things about San Sebastian. I desperately want to get there! Where are you living in Spain, by the way? For your next trip, I highly recommend you going to Basque Country in the North, it’s a complete 180 from the South. I saw San Sebastian is on your list–it is probably my favorite city in Spain. Also check out Bilbao and Lekeitio (a gorgeous pueblo on the coast.) Keep in mind though that Andalucia is by way cheaper than most other regions, i’d be interested to see how much 4 weeks in the north would cost you. Anyway, thanks for the great read! Cheers Craig. I actually did make it to Thyssen (though I hadn't last time I was in Madrid in 2004). It was a good museum, but this time around I definitely preferred the Reina Sofia. Your museum choices are fine. However, you missed the Thyssen-Bornemisza Museum in Madrid. One of the best in the world. Thanks Rachel! Granada was absolutely amazing. Can't wait to get back there sometime. love your notes on Spain. I spent a month in Granada and absolutely LOVED it. Isn't amazing that in some places they actually give you free tapas when you order a drink? we found a place that gave us delicious toasted ham and cheese bocadillos when we ordered sangria or tinto. delicious! I'm very disappointed in “Valencia not very turistic”. Did you see The city of the arts? Did you see The Serrano & Quart towers? Did you see circus place? Did you see the “river” ? Did you see the beach? Did you see the central market & La Lonja? If you've never been, you should definitely put it on your list. Yeah the first 2 weeks in a country always seem to be the most expensive. I knew I had some more time there so wad a little better at watching my funds. Unexpected costs can add up quick! Dina, luckily whenever all the food places were closed I could almost always find a bocadillo somewhere. At least in the bigger cities! Time is going by very fast. It doesn't seem that long ago that I was working in Boston… But it's been months already! I saw all of those except The serrano & quart towers so maybe it is a bit more turistic then I led on. But it just didn't feel turistic—maybe I was blinded by the newness of my trip, though. And I really liked the central market in Valencia—one of my favorites. The thing that I was difficult to accustomed to was having Spanish regular eating time. Before traveling, I was a student working in a lab. Meaning, I ate when I could. This strategy didn't work in Spain because many eatery only open during their eating time, and of course everybody goes home to enjoy siesta, my prime lunch hours. I miss tapas too, but I don't miss the tiny portion and the price. I think you did a fantastic job with your budget!! It's not the cheapest place to be and it all adds up so fast. I've been over budget my first two weeks but mostly because I've had to buy things (warmer shirts, a cell phone) that I hadn't been thinking about. Great post Adam. Spain sounds wonderful. I was suppose to go back in 2008, but had to cancel at the last minute :(. $63/day seems pretty reasonable as well! I wish I'd known the bar off the plaza with the free tapas. I found free tapas in a handful of places, but the best one I found in Madrid I never seemed to be able to find again. And I totally forgot to include tento de verano in the list of red wine drinks! It was good, if not strange. They've also got cerveza clara which is beer & Sprite. Strange, but not bad. And the budget includes all my bus trips (and one train), plus the ferry out of Spain to Morocco. Just not the arriving flight. Excellent post Adam. It brings me straight back to Spain – and I'd love to be there. I almost wish I took notes as I was reading this post so I could add my comments here – you touched on so much I agreed with! 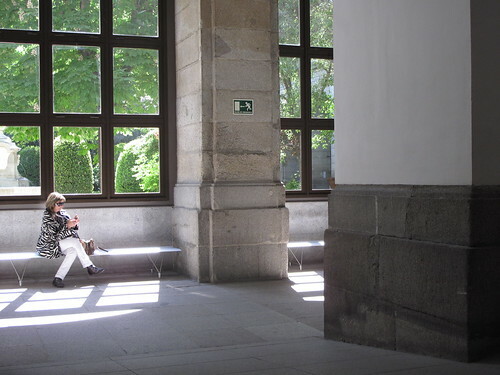 I absolutely loved the Reina Sofia as well – I liked it significantly more than the Prado. We spent an entire afternoon there and if time would have allowed, an entire next day would have been worthwhile. And I often get museumed out early on. I stayed at a great hostel in Madrid right off the Plaza del Sol and wish I could have recommended it to you. It was brand new 3 years ago – nicest hostel I stayed at in Europe. Also a great bar right off the Plaza – my mate and I went there every night for a week. They knew us by name by the time we left. The free tapas kept bringing us back! 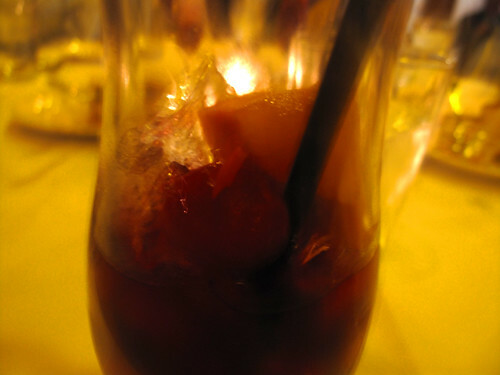 My drink in Spain was the tinto de verano. Beautiful. Your budget sounds pretty solid especially considering the amount of eating and drinking you did. Does that number include the transportation around Spain? @Stephanie – Go to Spain! Thanks Al! It's a wonderful place. glad I could remind you of your travels! Did you go to many different places and did you find it similarly affordable? Thanks Keith! It felt pretty cheap while I was there and then I started getting nervous when I put in the numbers. Worked out in the end though. I was in Spain a couple of months ago and absolutely loved it! Great post, really enjoyed reading it! Great pics. I love Sangria as I'm not a huge drinker and it's delish. Also love tapas. I definitely want to go to Spain one day. prices of Central America. But Spain is definitely manageable. Also you could probably do it cheaper if you don't visit quite as many cities (or avoid the more expensive, turistic places like Barcelona and Seville). It's hard to imagine anyone not enjoying Spain—regardless of the budget! Also, I think Spain is one of the best places anyone could enjoy in Europe. Glad you found it useful Sasha. 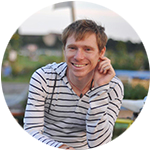 Adam, very nice review of what makes Spain a great value and a tourist destination. You covered all the highlights of your visit that tourists would want to know. Enjoyable read with informative information. Awesome post. I loved Spain and your number is helpful. I think you did pretty well. Brilliant post. Spain is #1 on my travel destinations list for Europe. Your budget is quite respectible, I hope I can hit a similar target & still enjoy myself. Great post!!! Reading about the food is making my mouth water so much!!! I'll definitely refer back to this when I head back to Spain!!! Definitely try to make it happen! I think I remember you saying you've been to Spain before, but it's so worth a second (or third!) visit. Thank you for writing this! After you and D's post I am just so convinced I need to somehow work Spain into the end of the RTW. It just has to happen. If it really is only $63 a day I think I could maybe swing it… guess I'll have to wait and see.